April 1, 2013, 10:18 a.m.
Times Haiku are generated from stories on the homepage of NYTimes.com, just in time for National Poetry Month. By Justin Ellis @JustinNXT April 1, 2013, 10:18 a.m.
New York Times senior software architect Jacob Harris has a thing for robots and wordplay. You may recall he’s the guy behind @nytimes_ebooks, the Times answer to the elusive and inscrutable Twitter bot @Horse_ebooks. 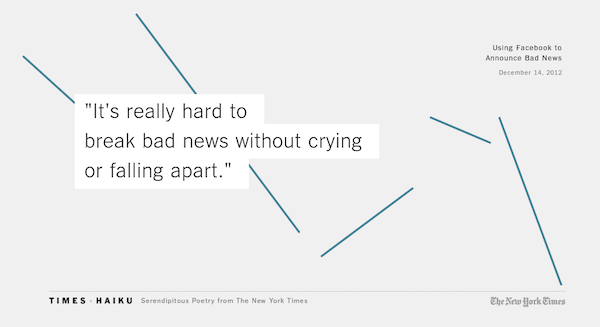 Times Haiku is a collection of what they are calling “serendipitous poetry,” derived from stories that have made the homepage of NYTimes.com. The haiku live on a Tumblr hosted by the Times. Harris built a script that mines stories for haiku-friendly words and then reassembles them into poetry. (For those of you that may have zoned out in class, haiku are comprised of three lines with, in order, five, seven, and five syllables.) The code checks words against an open source pronunciation dictionary, which handily also contains syllable counts. “Sometimes it can be an ordinary sentence in context, but pulled out of context it has a strange comedy or beauty to it,” Harris said. Harris was inspired by Haikuleaks, a similar project that found poetry in the cache of diplomatic cables released by WikiLeaks in 2010. The backbone of that project was an open source program called Haiku Finder, which crawls through text to generate haiku. The program was built in Python; Harris made his own version in Ruby on Rails. In its own poetic way, Times Haiku will be another access point for Times stories, said Marc Lavallee, assistant editor for interactive news at the Times. “If someone sees the site, or the image of an individual haiku and shares it on Tumblr, and it gets them to think about who we are and what we do, or gives them a moment of pause, I think we’ve succeeded in a way,” Lavallee said. Lexi Mainland, social media editor for the Times, said they wanted the poems to be able to stand on their own and be readily sharable. That’s why the haiku are actually images, which fits well with the aesthetic of Tumblr, she said. Outside of Tumblr, the Times will promote the haiku through the paper’s flagship Twitter account. That the Times has the ability to build a haiku bot isn’t surprising. But why build a haiku bot? “A lot of the projects we work on here are these incredibly big heaves, which are very, very gratifying,” said Mainland. “But you crave these smaller projects, which are just as valuable.” Similarly, projects like the haiku bot may seem silly on the surface, but the underlying code, the use of natural language processing, or other components could be valuable to future projects, Lavallee said. As whimsical as a haiku bot or a spammy-sounding Twitter bot might be, both are efforts to find new uses for the Times’ vast collection of work. “It’s just this large corpus of text that gets very dizzing to look through,” Harris said. The Times may also have a soft spot for artwork inspired by the written word. Anyone who has visited the lobby of The New York Times Building has likely seen Moveable Type, an algorithm-backed art installation that displays fragments of Times content across 560 display screens. But why poetry? For starters, today is the first day of National Poetry Month, Mainland said. (Today is also April Fool’s — and if you were wondering, this is not a joke.) Still, for lovers of verse, it may sound like a cold and bloodless way to create poetry. Can you really create poetry without a soul? Do robots have feelings? Can they really see a sunset, or be moved by the sounds of a whale songs CD? Harris admits the bot is imperfect; it’s required a little teaching along the way. One reason he limited the scope to the front page was because it provides an editor-picked selection, which tends to be richer features and important daily fare. (Running the bot on the Times Wire, Harris said he often got haiku made up of basketball scores, which may be too esoteric for any lit major or stat nerd.) The algorithm is designed to toss haiku with certain sentence constructions (sentences that start with a preposition, for instance) or from sensitive stories. Mainland, Lavallee, and Harris also keep an eye on the haiku being created to see if anything untoward sneaks through. But Harris also has to do some syllable counting himself, teaching the bot words that appear in the Times (“Rihanna,” for instance) that it doesn’t know. Henry Higgins would be proud. POSTED April 1, 2013, 10:18 a.m.
Ellis, Justin. 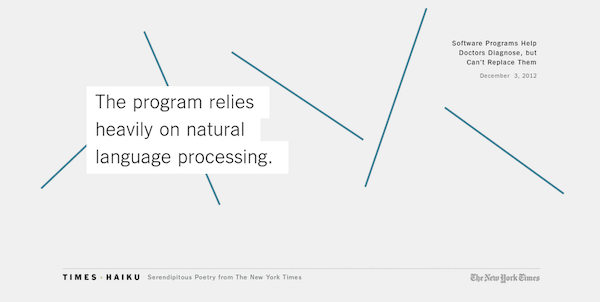 "Not an April Fool’s joke: The New York Times has built a haiku bot." Nieman Journalism Lab. Nieman Foundation for Journalism at Harvard, 1 Apr. 2013. Web. 20 Apr. 2019. Ellis, Justin. "Not an April Fool’s joke: The New York Times has built a haiku bot." Nieman Journalism Lab. Last modified April 1, 2013. Accessed April 20, 2019. https://www.niemanlab.org/2013/04/not-an-april-fools-joke-the-new-york-times-has-built-a-haiku-bot/.